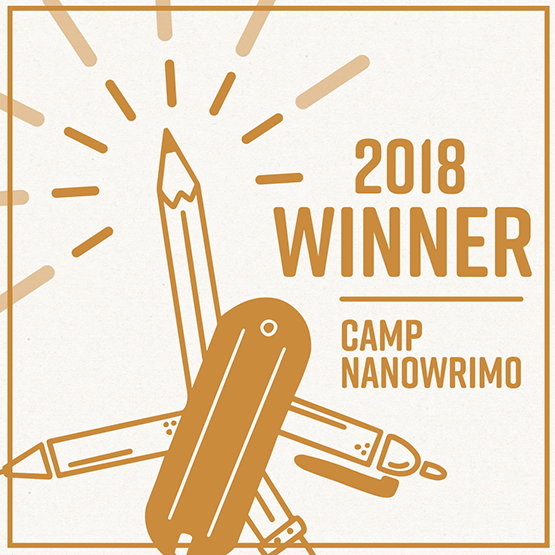 I started July 2018 Camp NaNoWriMo full of hope, and with a goal of 50,000 words. Sadly, I did not start Camp NaNoWriMo full of carbohydrates—instead 1 July 2018 was the day I started a ketogenic diet. Carb withdrawal kicked the [CENSORED] out of my plans. In the past, I might have given up and had a donut. (Wait, who am I kidding? It would have been lots of donuts. Many, many donuts. I would have moved into the nice all-night donut shop with all the power outlets so as to finish my 50K words…) But this time I decided my health was more important. Carb withdrawal is not forever, it just seems like it while you’re in it. It was over in two and a half weeks. The final two rounds of editing for my short story arrived with very tight deadlines. I needed a boost to get me writing, and hey! Camp NaNoWriMo kept sending these nice emails saying it wasn’t too late. I could still start and revise my goal. So I went back to Camp, revised my goal downwards, and counted both my editing time (at 1,000 words per hour) and actual words added to my novel. And I won. More importantly, I met my editor’s deadline. Yes, I won. I damn well deserve it. It would have been easy to feel sorry for myself last month. I didn’t get to finish my original goal. My birthday candles were stuck onto a banana, and I didn’t even get to eat the banana. Some of my other goals were derailed. It’s this stupid keto diet’s fault. Poor me! Poor me! Pour me a double chocolate malted. I didn’t go that way, though. What’s that about? What it’s about is actually taking care of myself. Treating myself with the care and affection and gentle discipline I would lavish on a dog. Treating myself with the kindness I would happily show a sick friend. Would I insist that a friend abandon a food plan that might save her life for the sake of a 50K word count? Or a birthday party? If I would, I would be one crappy friend. This is not the first time I have been through substance withdrawal. The first time was withdrawal from alcohol addiction—I got sober in June, 1978. I haven’t had a drink since. Thanks to my forty years of sobriety, I have a few harsh words for those who need to use a ketogenic diet—who are facing the very real and life-threatening conditions which a keto diet can treat or aid in treating—but find it just too hard. Learn that your life is more important than whether your Mom takes your refusal to eat her famous pasta dish personally. Yes, it hurts when she gets ticked off or bursts into tears. Learn to hurt. Learn that your life is more important than the “treats” in the office break room. Yes, it hurts when you see others eating what you’d like to, and doing so with no apparent ill-effects. You’re comparing your insides to their outsides. Learn to hurt. Learn that your life is more important than a freaking piece of birthday cake. That it’s more important that the latest dessert at your favourite restaurant. That’s it’s more important that eating what everyone else is eating. That it’s more important than what other people think of you. Yes, having that refined carbohydrate goodie would ease the pain, take away the social disapproval, satisfy your curiosity, mollify your mom. It would also mean that you would be refunded ALL the misery that you started the ketogenic diet to avoid. I’ve been alcohol-free, one day at a time, for forty years. I’ve been refined carbohydrate-free thirty days, one day at a time. I can do anything for one day. Anything. I’ll bet you can, too. Learn to live through today’s hurt to find the joy of healing.